Epilation wax in the spa salon. 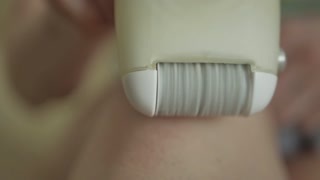 Beautician imposes wax on women's legs. Close-up. Roll on wax warmer. Legs of young woman, epilation. Beauty salon manicure workshop. Close up of beautician painting nails to female client. Woman in beauty spa salon doing manicure close up.